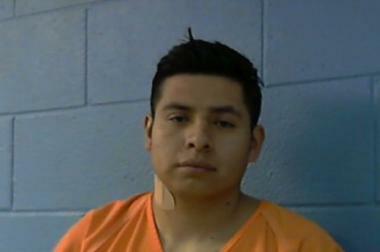 Miguel Mejia-Ramos was stopped in Texas and taken into custody. He is awaiting formal charges but is suspected of killing his wife and two daughters, the NYPD said. QUEENS — A drunken, raging construction worker asked his two young daughters for forgiveness and hugged and kissed them before brutally stabbing them to death after killing his wife, the Queens District Attorney's Office said. Miguel Mejia-Ramos, 29, confessed to the gruesome crime and told police he was drunk and snapped after seeing a photo of his spouse with another man, according to DA Richard Brown. Mejia-Ramos was charged with first-degree murder and faces life in prison without the possibility of parole for brutally stabbing his 21-year-old wife, Deisy Garcia, and their daughters Yoselin, 1, and Daniela Mejia, 2, in their Sutphin Boulevard home on Saturday, according to the DA's office. Mejia-Ramos was picked up by the U.S. Marshals Service in Schulenburg, Texas late Monday while driving through the state in a car with New York plates, according to an NYPD spokesman. He's being held at the Fayette County Sheriff's Office in Texas and is awaiting extradition to New York, where he is expected to be arraigned Friday morning in Queens Criminal Court on murder and weapons possession charges, according to the DA's office. The bodies of Yoselin and her two daughters were found Sunday evening by a 12-year-old boy who shared the home with the family, sources and relatives said. They were undiscovered for nearly a day. Mejia-Ramos told police he came home Saturday night after drinking beer with friends and flew into a jealous rage after seeing a photo of his wife with another man on her Facebook page and on her phone, prosecutors said. He allegedly grabbed a knife from the butcher block in the room and stood over his wife and daughters while they slept, the complaint says. His wife woke up and screamed, but he stabbed her — then grabbed another knife and stabbed her again after she ran away, twisting it into her side and breaking the knife, according to the complaint. His daughter Daniela was awake, and he told police he picked her up, gave her a hug and kiss and asked for her forgiveness before putting her back on her bed and stabbing her, prosecutors said. He also allegedly picked up his younger daughter, Yoselin, and hugged and kissed her before stabbing her to death. Police found four bloodied knives inside the house, and the bodies were found wrapped in a blanket, according to a relative of the boy who found them. Friends and relatives planned to gather on Thursday afternoon from 5 to 9 p.m. for a wake at the Sutphin Boulevard church Garcia attended, Iglesia Naciones Unidas en Cristo, according to the house of worship's Facebook page. The bodies will be later flown to Guatemala for burial, according to published reports. Brown said the crime was one of the most horrific he'd seen in his tenure as the borough's district attorney. "I was at the crime scene Sunday night and as I said at that time ‘I’ve seen a lot in my 23 years as District Attorney but there is nothing that disturbs me more than seeing young children — in this case mere babies — as homicide victims,'" he said.